Attachment Chef Stainless Steel Bowl with Handles,Fits with Chef (Classic, Premier and Titanium) Mixer, Kitchen machine accessory, 4.6 Liter Capacity, Bowl Outlet, Easier lifting and pouring, Dishwasher safe part, Stainless steel finish, Specially helpful for keeping pastry cool when mixing, Attachment, Chef Stainless Steel Bowl with Handles, Fits with Chef (Classic, Premier and Titanium) Mixer, Kitchen Bowl accessory, 4.6 Liter Capacity, Bowl Outlet, Easier lifting and pouring, Dishwasher safe part.This product is made to use overseas. This will not work in the US. 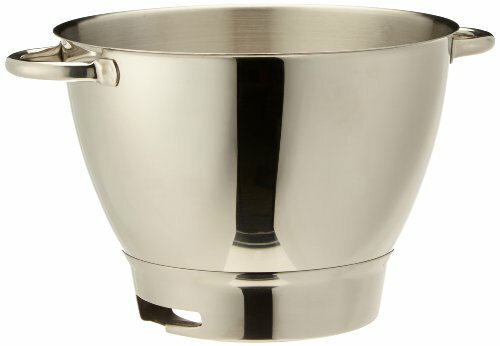 Stainless steel finish, Specially helpful for keeping pastry cool when mixing,Attachment, Chef Stainless Steel Bowl with Handles, Fits with Chef (Classic, Premier and Titanium) Mixer, Kitchen Bowl accessory, 4.6 Liter Capacity, Bowl Outlet, Easier lifting and pouring, Dishwasher safe part.